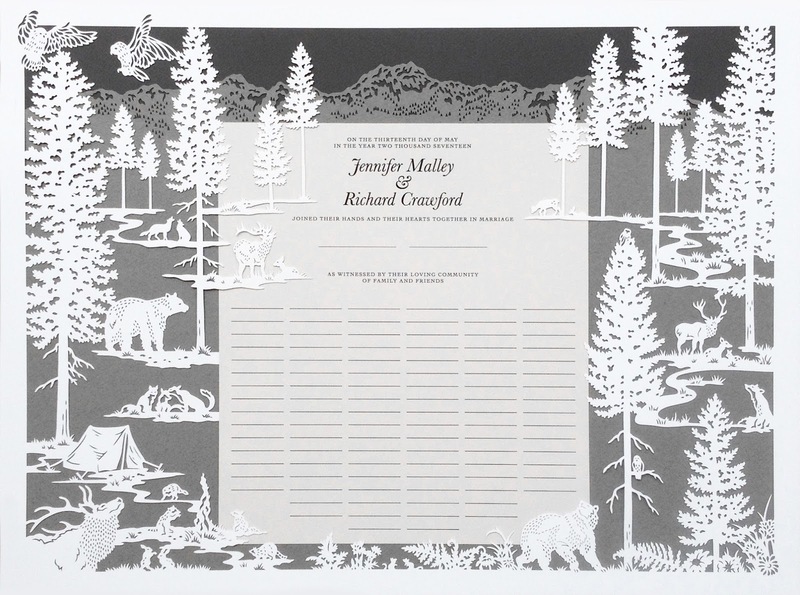 I make papercuts for all weddings, as luckily Jewish people aren't the only ones who thought of presenting their vows to their community in artful detail - take the QUAKERS for example. They take it a step further even and involve their community by having everyone sign their hand as witnesses to the union - making the ketubah pull double duty as both a troth keeper and a guestbook! There are different styles and ways to go about writing a Quaker certificate. Traditionally the text is short and written by the community of witnesses (it is most comparable to the Jewish ketubah's Egalitarian text). 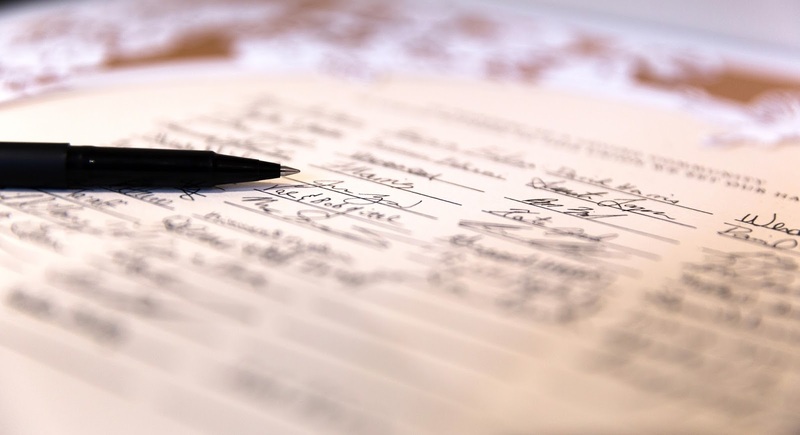 The more modern texts range from the bride and groom's vows followed by their signatures and their guests' signatures, to a succinct sentence declaring all the signatories witnesses to the union followed by the signature lines (read the text options I offer HERE). I like the approach that combines the couple's vows with space for all the wedding's guests because it has something for everyone. And I truly mean everyone, because like the Jewish ketubah, the Quaker certificate has been adopted and adapted by couples of all faiths and persuasions for their weddings, as seen below. Months later Chihiro & Jon contacted me to inquire after customizing one of my existing designs to accommodate additional signature lines for their Interfaith wedding. 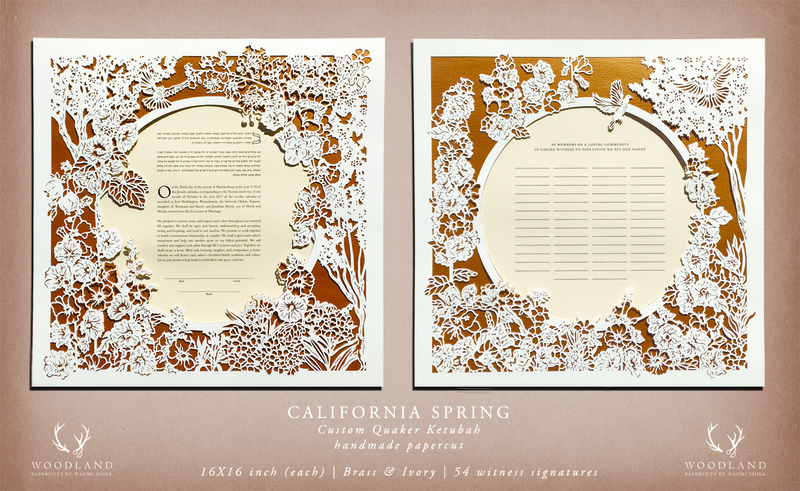 They wanted one panel for the ketubah text, and another to accommodate 54 of their guests' signatures. After discussing the options they opted to have a fully custom design that will embody everything they love about California. They sent me a sweet email - with a beautiful photo! - about their history, their relationship, and what they are looking for in their ketubah, and gave me free reign to create something beautiful. I am happy to say that this fun-loving fast-paced couple's energy rubbed off on me a little and this order truly went like a breeze. I created two panels of identical proportions and layout to compliment each other. This design includes my favorite play of hiding little treasures for the observer to find along the way (can you spot their pet dogs?). Really the only hiccup in the entire process was that the designing stage fell squarely in the Jewish holiday season without me realizing until my family showed up for dinner - Oops! - which caused me to lose my mind and delay the delivery of Chihiro & Jon's design mockup by a few days. The wait was well worth it though, as once they saw it they approved me to proceed and I whipped out my blades immediately! I was in a panic looking for an artist until I came upon your website. 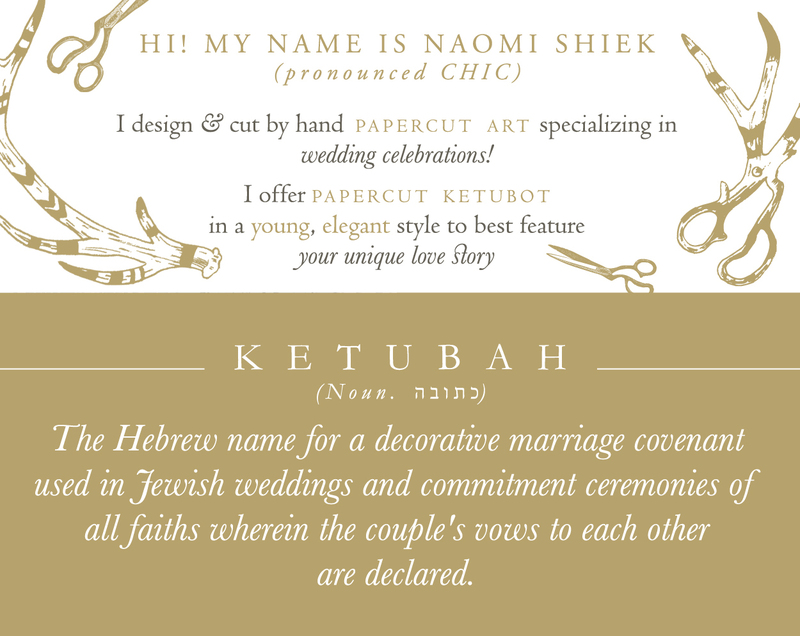 I decided to increase our ketubah budget because I knew that I wanted to have a custom design from you! Thank you so so so much for working with our timeline and being super responsive. 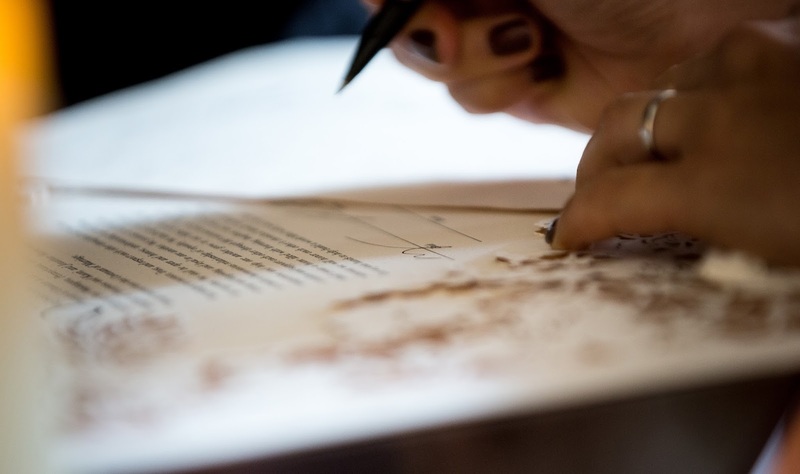 As I am writing this blog post I got an email from Chihiro with photos of the ketubah & signing panels in action, which she graciously allowed me to share with you. 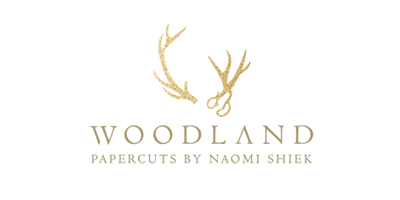 It's not often that I get to see the papercuts I work so hard on serve their purpose as wedding keepsakes-come-cherished artworks, and I am absolutely overjoyed for Chihiro who said her guests loved the idea.